To celebrate sibling day*, our family met with my sister and her family to visit our nation’s capital. The cherry blossoms were days from full bloom, but it already was a gorgeous sight. Besides seeing the great memorials to our country’s true heroes and patriots who gave their lives for our freedom and freedom around the world, we were also able to visit the Smithsonian Zoo. The highlight of the zoo was observing the Giant Pandas and their young cub. There was excitement building as we approached the exhibit and heard the murmurs of the crowd. 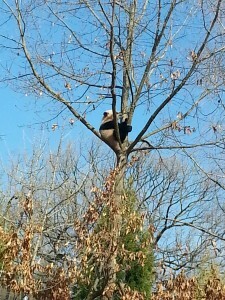 Bao Bao, the 7-month-old cub, had climbed a tree and was twenty feet in the air. He was restless and moving slowly and gingerly, as if he was trying not to fall. His mother, Tian Tian, seemed to be oblivious to Bao Bao’s struggles while snacking on some bamboo. There were fleeting moments of anxiety in which we wondered if Bao Bao would be ok. Would Bao Bao fall? Can he climb down as easily as he can climb up? Well, Bao Bao ended up being fine. He finally found a comfortable spot to take a nap up in the tree. He just wanted some alone time away from his parents, like a typical adolescent! This scene of God’s creation was a teaching moment. All Bao Bao had to do was cry out and his mother would be there so quickly. Of course, I was wrong and he wasn’t in any danger at all, but it reminded me about our relationship with God: We get stuck in our own tree. Our doubts, fears, and anxieties can cripple us. Often we try to fix it ourselves, and not call on God. What a great reminder that the Lord Almighty hears us when we cry. He is near to us when we call upon Him. He is not distant, nor is He silent. We can cry to Him with our problems, worries, and cares because He cares for us (1 Peter 5:7). We can be saved by calling upon the name of the Lord and trusting in Jesus Christ alone. (Romans 10:13, 3:22-24). And that is the bare truth!